The pontificate of Benedict XVI has been a short, bracing, and often surprising journey in discipleship. It has been quite a week. My head is still spinning, and I’m sure that only half of it is due to the flu, fever, and medication I’ve been fighting, enduring, and imbibing (respectively) since last Sunday afternoon. Where to start? How about with the head of the Catholic Church? Consider: He is brilliant, yet enigmatic. Some find him inspiring; others think he is frightening. Some insist his reign is the result of mythology, superstition, and ignorance. Others claim he is the personification of humility, service, and true charity. In some corners, he is rejected for his politically incorrect views about marriage and sexuality, and his insistence that only certain men, no women at all, can be priests or bishops. His talk of sin and of eternal judgment has upset many, but his call to discipleship, sacrifice, and humble worship resonates with countless millions. But there has often been talk of scandal. One of those closest to him betrayed his trust, exposing him to ridicule. There was even talk of arrest and prosecution. Some within his inner circle have apparently been more interested in pursuing power than in service. He is, in short, controversial—a lightning rod for debate, discussion and, sadly, division. Yes, I think you get what I’m getting at and the man I am describing: Jesus of Nazareth, The Head of the Catholic Church. He is central to the events of the past week for many reasons, not least because he established the Church, founded the papacy upon the petra of the flawed fisherman Petros, and promised to preserve the Church against the gates of Hades, never mind the flailing assaults of clueless pundits and minor heretics. This same crucified and risen Jesus, of course, is central to the thought, work, and life of his current Vicar of Rome, Pope Benedict XVI. It’s not that previous pontiffs haven’t loved Christ deeply and fully—far from it. But, to give just one obvious example, Joseph Ratzinger’s Jesus of Nazareth “trilogy”, written during his eight short years as pope, was a rather unusual enterprise. It tells us something essential about the man, to the degree that Fr. James Martin, SJ, suggests, with merit, that the three books may prove to be Benedict’s “greatest legacy”. There has already been much talk of Benedict’s “legacy”. I suspect that many Americans think of a legacy in terms of “what something or someone means to me”, that is, in ways mostly subjective, personal, and quite immediate. There is a partial truth to this perspective, but by itself it misses the deep sense of continuity and inheritance implicit in the word “legacy”, which derives from the Latin words (legatia, legatus) referring to a body of persons—ambassadors—sent on a particular mission. The word “mission” is a significant one in Catholic theology, used to refer to the missions of the three Divine Persons, supernatural and saving missions “which are continued in the mission of the Church” (CCC, 257). Mission, in other words, flows from Trinitarian communion, which in turn shapes the communion of the Church, which then goes forth with her missio, sent to proclaim the Gospel and to make disciples of all nations. May the invitation to conversion, to “return to God with all our heart”, resonate strongly in us, accepting His grace that makes us new men and women, with the surprising news that is participating in the very life of Jesus. This legacy, it goes without saying, is not of much interest to the networks and the news shapers. I emphasize the above because, having now read far too many pieces about Benedict’s renouncement of the papal office, I am fairly resigned (pun intended!) to the fact that most of the talk and conversation—certainly in the secular media—will be about intrigue, scandal, secrecy, power, politics, and so forth. It’s expected; it doesn’t surprise me and, surprisingly, it doesn’t even really upset me (yes, that’s how under the weather I am). What else but personalities, politics, and power will pundits discuss when all they know are personalities, politics, and power? Pope Benedict’s efforts to address the cultural divisions between Islam and Christianity briefly stirred controversy in 2006 when the pontiff delivered an academic speech that quoted a Byzantine emperor making deprecating remarks about the Prophet Muhammad. A wave of deadly riots washed across the Muslim world, prompting an apology from the pope. The address was about culture, but it was about much more: the theological and philosophical roots of culture, and how flawed understandings of God’s nature have far-reaching and often serious, even deadly, implications. And Benedict’s apology was a small revelation in itself, for he didn’t retract anything he had said: “At this time, I wish also to add that I am deeply sorry for the reactions in some countries to a few passages of my address at the University of Regensburg, which were considered offensive to the sensibility of Muslims.” Unfortunately, the violent actions of various Islamic groups following the address only validated Benedict’s argument—a point ignored by virtually all non-Catholic news outlets. In many cases, Benedict could never “win”, and I doubt he was ever blind to his difficult situation. Throughout his pontificate, he has been criticized by many for being heavy-handed and authoritarian. Then again, he has been derided for being weak, timid, and incapable of handling the reins of the wild steed named “the Vatican”. Surely only a man of diverse and inscrutable talents could be both so powerful and so weak! (Does anyone else see any parallels with how the American media often portrayed Pres. George W. Bush?) Most people have been fed a series of images—either visual or painted with words—portraying Benedict XVI as out of touch, backwards, narrow-minded, reactionary, anti-woman, and so forth. As Ryan N. S. Topping notes in his exceptional new book, Rebuilding Catholic Culture (Sophia, 2012), “Each age nurses its own vices; one of ours is to substitute images for ideas. … But the study of doctrine, to reduce principles merely to politics would be simply to miss a great deal. … Theology is, ultimately, the study not of personalities but of reality—in fact the most real reality of all.” That “real reality” has always been Benedict’s focus; it’s hardly his fault that the world is overrun by hordes of delicately scented barbarians who care not one whit about the same. I’ve learned over the years that more than a few people who express a vague admiration for John Paul II actually know little or nothing about his writings and teachings. They are attracted to him—or to a particular image of him they have obtained through one media source or another. But, then, the rich young ruler was also attracted to Jesus. The essential question, always, is: will you take up the Cross? Will you follow the Master? As everyone dies, it was important that John Paul defied the aimless Culture of Death by showing how to die, but that witness also came at the cost of care of the churches. There were times then when the Church Militant seemed in freefall, and the man who then was Cardinal Ratzinger must have anguished much in silence. 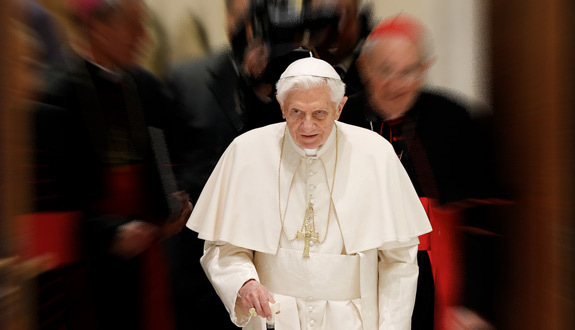 … A most attractive charism of Benedict XVI has been his desire to vanish so that the faithful might see only Christ: “cupio dissolvi.” He strengthened the papacy by vaulting sanctity over celebrity. In a grand paradox, nothing in him has become so conspicuous as his desire to disappear. Cardinal Francis Arinze put it more directly, but just as well. “Our faith is not in the pope,” he said shortly after Benedict’s announcement, “it is in Christ… So this event can help all of us to be deeper in our faith. To be, shall we say, less sentimental.” The last bit is more important than it might appear initially. Benedict XVI is, by all accounts, a very warm and personable man, but I’ve never heard the word “sentimental” associated with him. The fact is, we live not in the Information Age, but in the Sentimental Age, driven not by good thinking, tested prudence, or treasured wisdom, but by sentiments, feelings, emotions. Everywhere we turn, there are voices and texts and tweets flooding us with feelings and opinions. But we need to remember that Benedict XVI is arguably the most intellectual pope to sit in Peter’s Chair for centuries—even more so than his saintly predecessor, who was certainly no slouch in the world of ideas. And if there is one single thing that stands out in Benedict’s papacy, it’s this: his laser-like focus on the root-cause of the intellectual crisis that explains not only Western culture’s present wallowing in facile relativism that’s on full display in the content-free rhetoric of your average EU politician, but also the trauma that explains the violence and rage that continues to shake the Islamic world and which Islam seems incapable of resolving on its own terms. And that problem is one of reason. As Benedict spelt out in four key addresses that repay careful re-reading—the famous 2006 Regensburg lecture, his 2008 address to the French intellectual world, his speech to the Bundestag in 2011, and his remarks to the world of British politics in 2010 in Westminster Hall (the site, not coincidentally, of St Thomas More’s show-trial in 1535)—man, especially Western man, has lost confidence in reason’s power to know more-than-empirical truth. (For a shorter, more humorous take on the same theme, by a non-Catholic writer, see this post by Andrew Klavan.) Personally, I have benefited most deeply from Benedict’s explication of Scripture and his analysis of the current intellectual and spiritual crises. I don’t see the two as somehow separate from another; on the contrary, I find Benedict’s penetrating and nuanced apprehension of the failings of our age to be rooted in a deeply biblical vision of God and man, creation and society, family and politics, Church and state. The first Ratzinger book I ever read was Daughter Zion, and after reading it, I realized the author did not just know Scripture, but breathed it. He is a man who loves and lives the Word of God. Benedict has recognized his weakness and, without any sentimentality or political posturing, is handing the office back to the One who founded it. He knows that he was Peter for a while only by the will of the One who created him, and he trusts completely that the Church, however battered and embattled today, will carry on toward the eschaton precisely because of the will, grace, and love of Jesus Christ, the Head of the Church.